Along with Eric Clapton and Jack Nicholson, Ted Bundy was another famous person to have grown up thinking his mother was his sister. His father is unknown. His mother claims that it was a sailor she met named Jack Worthington, but his family suspected that was a cover up story and his real father is his grandfather, Samuel Cowell, who was known to be abusive. Samuel Cowell and his wife Eleanor were the ones who raised Bundy. 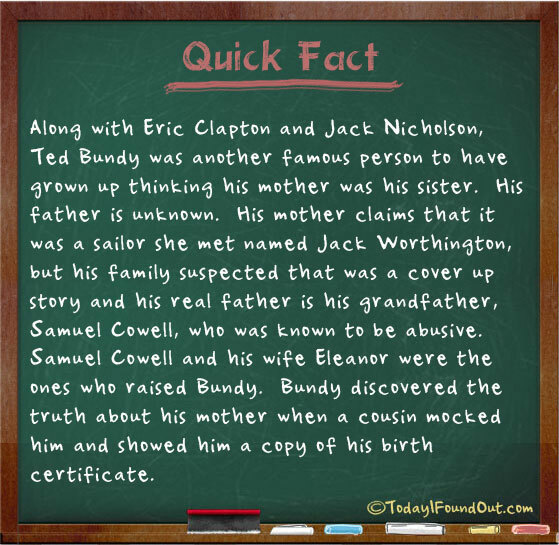 Bundy discovered the truth about his mother when a cousin mocked him and showed him a copy of his birth certificate.